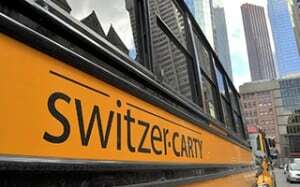 Switzer-CARTY Wins 150 Bus Contract To Serve Toronto Student Transportation Group. Switzer-CARTY is pleased to announce that it was a successful bidder in the recent request for proposal for school bus routes for the Toronto Student Transportation Group consortia servicing the Toronto District School Board and the Toronto Catholic District School Boards. Starting in September 2016, Switzer-CARTY will be operating 150 school bus routes in the Greater Toronto area for the Toronto Student Transportation Group. Switzer-CARTY will shortly begin efforts to open a local branch facility to dispatch and maintain its fleet and will hire staff from the local community for school start-up next September 2016. Anyone interested in joining the Switzer-CARTY team may apply for employment here. Visit us on Facebook or re-visit this website to stay informed of upcoming employment open-houses which Switzer-CARTY will be hosting within the community to meet and greet people interested in employment opportunities.